A slight tremor snaked through Matt Curtis as though he’d been hit by an errant chill. He looked at his blood-smeared gloved hands and, for a beat, wondered about it. He let the moment pass and announced, “Let’s close her up.” Matt removed the spreaders that had kept the incision open and used a syringe to inject sterile water into the woman’s open hip wound. Then he took the surgical thread from the nurse. About to go to work on the wound, he felt suddenly unsettled. Another tremor hit, but this time it was more severe. It seemed to emanate from within. His hands shook; sweat instantly drenched his body; he gasped for breath. And then, like a shimmering hologram, his sister Susan’s image filled his vision. Her body appeared translucent; a brilliant aura radiated from her head. Matt looked over at John Ransom, the orthopedic surgeon assisting him. Ransom stared back at him, eyebrows raised in question. Matt’s gaze shifted to the two surgical nurses. They, like Ransom, seemed frozen in place, concern and wonder etched their faces. Matt grabbed the edge of the stainless steel table and pressed his eyes shut. For a few seconds, his brain seemed foggy. He felt faint, disoriented. Then the feeling stopped and left him only slightly light-headed. He opened his eyes and searched the room for Susan. Matt squeezed his eyes shut again, ordered himself to get a grip, and looked again at Ransom. “Yeah, I’m fine,” he lied. He used an arm to shield his eyes from the intense glare of the overhead lamp. A smoky haze seemed to fill the room and, for a moment, Matt thought the walls undulated. His vision blurred, as though a filter had been placed over his eyes. Matt forced himself to appear calm. “John, finish up,” he said. He wheeled around and left the operating room. He stripped off his cap, mask, bloodied surgical gown, gloves, and booties and washed his arms up to his biceps at the first sink outside the University of New Mexico’s orthopedic surgical suite. He looked up at the wall clock over the sink; had to squint to make out the time. Three-fifteen in the morning. Nothing new in that. Since cancer took his wife, Allison, a decade ago, he’d poured every ounce of energy into his patients with demonic intensity. He and Allison had tried to have children but, after three miscarriages, she couldn’t bear the loss anymore. Allison, Susan, and Matt’s mother had been enough for Matt. But not for Allison. So they’d adopted two little boys. Allison was the perfect mother and Matt the perfect provider. But, after Allison died, Matt didn’t know how to fill the hole in his sons’ hearts. Two years later, they were both off to college. Now they were adults and strangers. He felt as though he’d just run a marathon. Tired. Weak. Used up. Sure, it was the middle of the night. He’d been on his feet since 7 a.m. the previous day. One operation after another. Too few surgeons, too many patients. But he’d worked that kind of schedule for years. I’m getting old, Matt thought. Fifty-one and I feel seventy. Matt shuffled to the doctors’ locker room, the picture of Susan imprinted on his mind’s eye. There was no one, other than his two sons, who meant as much to him as his sister did. Despite the four-year difference in their ages, he and Susan had been like twins their entire lives. They finished one another’s sentences; felt the other’s pain. But what the hell was that all about back in the operating room? He stripped off his clothes and dumped them in a laundry basket, then shuffled to a shower stall. He adjusted the water flow to pulse, then placed his two palms against the shower wall, bowed his head, and groaned as the water pounded his skin and cascaded over him. His muscles ached, his backbone felt permanently bent. Matt repeated his daily ritual: He ran a finger down the scar on his lower back, over his spine, and silently thanked God that he could stand at all. The doctors had told him he might never walk again after his car crash in high school. He reached higher and touched one of the three puckered scars on his upper back—he no longer had the flexibility to reach the other two—and wondered how much luck one person was due in a lifetime. Three bullets in the back, over thirty years ago, compliments of a Serb soldier. After ten minutes, Matt reluctantly turned off the water. He grabbed a towel from a shelf, rubbed it roughly over his skin, and wrapped it around his waist. Then he snatched another towel and draped it over his shoulders. He walked back to the locker room and eased onto a wooden bench. Bent over, elbows on his thighs, face in his hands, he released a low moan and again wondered what had happened in the operating room. It had been a momentary, eerie sensation. Couldn’t have lasted more than a few seconds. Maybe he’d better schedule a physical. Then another chill hit him, as though an Arctic wind had invaded the locker room. Matt turned to see who had opened the door, but there was no one. Matt’s skin prickled, the hair on his arms stood at attention. He felt a presence; certain someone had entered the room. “Damn,” he whispered through gritted teeth, as he looked around again. No one. He stood and shucked the towels, opened his locker, and reached for his street clothes. Even when he finished dressing, the chill he’d felt hadn’t completely gone away. Probably just need a good night’s sleep, he thought. Then he made a mental note to call Susan. “Where’s the rookie?” Callahan asked and looked around in the glow provided by the pole lights around the parking lot and the nearly full moon. Mokapua hooked a thumb in the direction of one of the towering palm trees that bordered the parking lot. “Over there fertilizing the flora,” he said. Callahan looked in the direction Mokapua pointed and saw the silhouette of a bent-over man. For a moment, he remembered the first corpse he’d seen when he was a rookie. Back in New York City when he wore NYPD blue. He’d barfed then. Callahan looked down at his brown Santoni loafers and grimaced at the thought of puking on his four hundred dollar shoes, as he’d done on those clunky black lace-ups twenty years ago. Then Callahan turned back to the sergeant and gave him a “go ahead” gesture with his hand. Callahan tightened his silk Versace tie and pulled on his shirtsleeves so an inch of white cuff showed beyond the arms of his raw silk sport coat. He circled the woman’s body, careful not to tread in the blood pools. Her body lay face down, arms and legs unnaturally bent, like a scarecrow. He looked up at the building, a thirty-story pale yellow monolith with balconies that made it look like an enormous chest of drawers. Hell of a long way to fall, he thought. That reminded him of the old joke that homicide detectives tell when they investigate a jumper: It’s not the fall that kills them, it’s the sudden stop. He glanced at the moon that shone like a heavenly searchlight, its glow bronzing the windows of one of the Waikiki Beach hotels in the distance. Great way to start the day—with a leaper! But he had no choice. This had to be his case. “No, sir,” Mokapua said, indignantly. A white ambulance turned into the parking lot. The rotating beams of its red and white flashers bounced off the side of the condominium building. Callahan watched it stop, then turned again to Mokapua. “Yes, sir.” Mokapua started toward his patrol car on the far end of the parking lot, but stopped and turned back. “Don’t you want to know the woman’s name?” he asked, as he tipped his head in the direction of the corpse. The monotonous drone of the airplane engines seemed tortuous. Like high-pitched, buzzing whispers that attacked his sanity. “Susan’s dead. Susan’s dead. You let her down. You let her down.” Then, over and over again, “Susan committed suicide. Susan committed suicide. Susan committed suicide.” After hours of the same synchronous hum, Matt thought he would go mad. He balled his hands so tight, the muscles in his forearms cramped. He thought about the telephone call from his secretary, Linda, that morning. The phone had jarred him from a nightmare-punctuated sleep. Linda’s message only accentuated the nightmare. The Honolulu Police had called Matt’s office. His sister Susan was dead. He’d dropped the phone, walked to the bedroom window, thrown the drapes aside, and stared unseeing at the Sandia Mountains on Albuquerque’s east side. Susan died just after three o’clock, New Mexico time, Linda had told him. About the time he’d felt disoriented in the operating room. When he thought he’d seen Susan’s image. Then he remembered the chill he’d felt moments later in the locker room. The cool presence of someone . . . or something. Tears ran down his cheeks; his throat was suddenly so parched he couldn’t swallow. He felt hollow. “Oh God,” Matt muttered as he unclenched, then re-clenched his fists. Matt knew he wasn’t responsible for his sister’s death. Not in a legal sense, anyway. He didn’t even know for sure if her death had anything to do with what he’d said or done, but he found it difficult to rationalize his innocence, especially with the anvil-heavy burden that weighed on his heart. Poor Susan. Matt could never tell if she was happy. Most people who knew her would probably say she led a gloomy existence—forty-seven, never married, wedded to her job. That’s how he thought of her life. Gloomy. “Dammit!” Matt muttered, as he turned to the jumbo jet’s window to hide his tears. Matt brushed a hand over his eyes and swallowed, then turned and looked at the man seated next to him. “No. It was nothing,” he said, and half-waved dismissively at his seatmate. “You going to Hawaii on business?” the man asked with a smile. Matt looked back through the window and stared out at a seemingly endless white sea of cotton clouds. He hoped there was a heaven, where all three women he’d loved could be together. Safe. His wife, Allison, dead from cancer ten years ago, his mother felled by a stroke barely a month ago, and now Susan. He thought about Susan when she was little. She tagged along; wanted to be “one of the boys.” Was tougher than most of them. When he pictured her missing-tooth smile and scraped knees, his sadness only escalated. His eyes burned and his throat constricted. God, how he’d loved her! The Honolulu detective he’d called had said it was suicide. The coroner was expected to make it official in a day or two. After the autopsy. Twenty-four floors from the balcony to the parking lot, the cop had told him. The detective had paused. “I’m sorry for your loss, Doctor Curtis,” he’d said, clearly unconvinced. Matt could tell the detective’s mind was made up. It was suicide—plain and simple. Susan Curtis took a header off a high-rise building. The detective was going through the motions. Suicide! No way! She wouldn’t do that to herself. She wouldn’t do that to me. Suspense Publishing. Copyright © Joseph Badal, 2016. 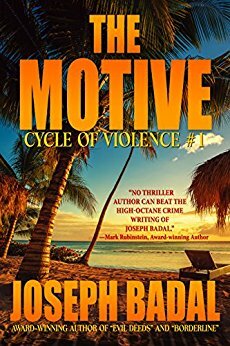 Be the first to comment on "“The Motive” Cycle of Violence book #1 by: Joseph Badal (special excerpt)"